When France was mistress of half of North America the dream of the many bold spirits among her explorers and voyageurs was the finding of a northwest passage to the Western sea, as they designated the Pacific Ocean, and to this end, they devoted much valorous effort. It meant fighting their way across trackless wilderness for thousands of miles and the braving of countless dangers. These courageous men went forth into the haunts of wild beasts and the Indian country for the glory of France and adventure. The bones of many of them were left to bleach where they died, and all they left behind them was the record of a vain effort, as far as the finding of an outlet to the Pacific Ocean was concerned. It was this quest that led to the discovery of the Rocky Mountains by European explorers. Prominent among the gentleman adventurers and explorers of the New France of that day was the Sieur de La Verendrye. All his life he had ridden through the western wilds, going where no white man had gone before, seeking for that which he and his fellows could not find, and finally, in his old age, passing on the work of finding a passage to the west to his devoted sons, Pierre and the Chevalier, who had accompanied him on many of his expeditions. And, although the La Verendryes failed to find a way to the sea of the west, they carried the tri-color of France far into unexplored territory and helped to make possible the achievements and discoveries of those who followed them. In one of his expeditions the elder La Verendrye went far into the west, reaching what is now North Dakota. There, on the Missouri River, he found the Mandan Indians and was the first white man to visit them. These Indians lived in comfortable huts and tilled fields and were far in advance of their red brothers of other tribes. La Verendrye established friendly relations with them, and it was because of the good impression that he made that the tribe afforded sustenance and shelter to many explorers who came after him, including Lewis and Clark. From this, La Verendrye assumed two things. Mandan had been on the shore of the sea for which he was looking, or had come in contact with Spanish settlements to the west. He thought perhaps the Spaniards were getting a foothold too far north and were putting French interests in jeopardy. 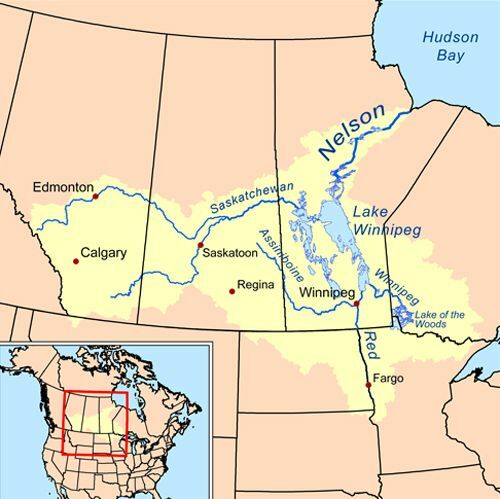 So he made the long trip back from the Upper Missouri country to Montreal to acquaint his government with this important news and to get authority and money to lead an expedition farther west to block the Spaniard, and perhaps to find the Western sea. His tale was listened to by an indifferent governor, and no cash was forthcoming. By this time, La Verendrye was in the winter of life, old because of the life of hardship he had led, and broken in health. He felt unequal to the task of continuing his work, which he must do on his own resources, and reluctantly passed his mission on to his sons, Pierre and the Chevalier, whom he had schooled in woodcraft, and who shared his enthusiasm for his purpose. Without means and with but two fellow countrymen, they went out into the west, their destination being the land of the Mandan nation, where, after a trip of great hardship, they arrived in the spring of 1742. Their purpose was to learn the source of the stories which the Mandan had told their father, and to continue the search for the passage into the west. The Mandan, their father’s friends, received them most hospitably. At that time, the Mandan were expecting a visit from a tribe known as the Horse Indians, a migratory group whom the Mandan chiefs believed could guide the French explorers to salt water. The La Verendryes waited for a month and then, with Mandan guides, started out in search of them. Instead, they found Crow Indians, who could but repeat the tale that had come to the Mandan, and sent them further west with Crow guides to the Bow Indians, of the Sioux family. When the La Verendryes arrived at the Bow encampment they found these Indians about to go to war with the Snake tribe, and were gathering their warriors and those of their allies in great numbers. 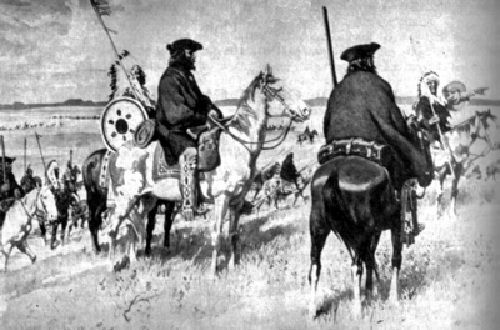 They knew nothing of the way to the Western sea, but, suggested that the Frenchmen accompany them on their expedition against the Snake, which meant traveling to the west and towards the mountains, where, from Snake prisoners or other western Indians they might be able to learn something of the much sought for passage. The Frenchmen gladly accepted the invitation, and the great force of warriors and their families moved slowly towards the country of their enemies, gathering strength as they traveled. On January 1, 1743, a snow-capped mountain range loomed up before them, the peaks, in the far distance, scintillating in the bright sunshine like diamonds. The poetic Frenchmen named them the “Shining Mountains,” as they are known in poetry and Indian legend to this day. For the first time the white race, through the eyes of the La Verendryes, was looking upon the great range of the Rocky mountains. 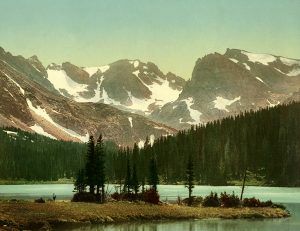 Historians are agreed that the mountains which met their vision at this point was the Big Horn range, about 120 miles east of Yellowstone National Park. At that time the explorers and their Indian friends must have been near the northeastern boundary of what is now Wyoming. In passing, it should be said that there was no battle fought between the Bow and Snake at that time, as the tribes missed each other. The La Verendryes then parted company with the Bow Indians and gave up their quest for a way to the Western sea. On an eminence, now generally supposed to be in South Dakota, on the banks of the Missouri River, they buried a leaden plate engraved with the arms of the king of France and built over it a cairn of stones. At the end of 1743 they were back at the Assinniboine River. For thirteen years they had followed a hopeless quest. 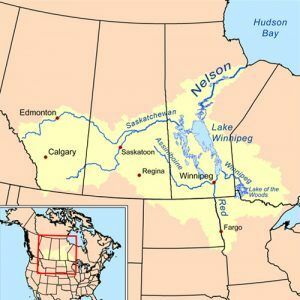 Instead of a Western sea they had found a sea of prairie, the Rocky Mountains and two great rivers, the Saskatchewan and the Missouri. On their arrival at Montreal the elder La Verendrye was decorated with the Cross of St. Louis and the two sons were given minor posts in the army. The father died in 1750, and after the English had conquered Canada, the eldest son sailed for France on a ship which was lost with all on board. The younger son remained in Canada. Compiled by Kathy Weiser/Legends of America, updated August, 2017. About This Article: Discovery of the Rocky Mountains was published in 1922 as a chapter in the book Back-trailing on the Old Frontiers published by the Cheely-Raban Syndicate of Great Falls, Montana. The book was the first in a three volume series which published a number of stories illustrated by Charles M. Russell, which had appeared in Sunday editions of daily newspapers in all parts of the United States. The article is not verbatim as it has been slightly edited for grammatical corrections.